The figure of Galileo Chini (1873 – 1956) stands out in the panorama of Italian art between the nineteenth and twentieth century. With his multifaceted and precocious talent, he excelled in every aspect of art he ventured into. 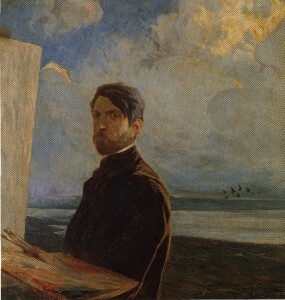 He was a great designer, sublime ceramicist (he founded “L’Arte della Ceramica” and later “Fornaci San Lorenzo”, introducing Art Nouveau into Italian heritage); he was an illustrator, set designer (he made the scenes of the first production of Puccini’s Turandot), urban planner, and painter with a strong personality that ranged from Symbolism to Divisionism to a darker, expressionist final stage. As an artist of European stature, he participated in all major international exhibitions (London, Brussels, Ghent and St. Petersburg and others) and in Italy in the Venice Biennial and Rome Quadrennial. Chini was commissioned to decorate major public and private buildings and in 1911 he left for Siam to decorate, at the request of King Rama V, the interior of the new Throne Palace of Bangkok, where he created his most extraordinary decorative work. Upon returning to Italy, he continued his unceasing creative output. He firmly believed in the union of arts and crafts and their fundamental role in the redevelopment of the urban landscape. He was a member of the commission set up for the restoration of the buildings of the Viareggio Promenade and made the entire decorative structure of the Berzieri Baths in Salsomaggiore. He taught at the Academy of Florence, where Ottone Rosai, Primo Conti and Marino Marini were his pupils. In the final years of his life, Chini focused on an intimate and lyrical style of easel painting, with works denouncing the ravages of World War II and gloomy depictions of death.